Education ministers have published a prospectus on their plans for schools in England to be open from 8am to 6pm. They are putting £680m up to 2008 into encouraging more schools to set up breakfast and after-school clubs, to help working parents. The plans - first announced last summer - will not involve teachers. Instead, volunteers and the private sector are expected to offer facilities such as sport or language clubs, which many schools already provide. Teaching unions have cautiously welcomed the promise that their members' workloads will not increase. 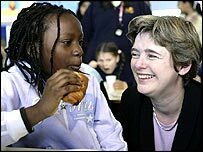 Education Secretary Ruth Kelly visited a breakfast club at a school in east London to publicise what she hopes will come to be called "Kelly hours", although the scheme was launched by her predecessor, Charles Clarke. She made the point that many schools already offer something similar. "It is a really good example of what is already happening in schools. "When you open the doors of a school, children should be able to come in and have breakfast." The issue was choice for parents and children. "By 2010 children should have access to a whole range of activities," she said. "Six hundred and eighty million pounds is a significant sum and it should make a real difference." Her department said that of the £680m, £430m would be distributed to schools via local authorities who were best placed to prioritise need and plan the development of services across their area. This includes £16m for the "national remodelling team" which will help implement the changes and £32m for a behaviour improvement programme. The other £250m would go direct to schools to start to develop extended services. Children's minister Beverley Hughes said the allocations would mean about £30,000 for a typical primary school and £50,000 for a secondary. 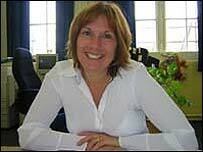 She told BBC Radio 4's Today programme: "It gives them the resources to start the planning process." Schools which already operate such schemes say it costs them much larger sums. The prospectus makes clear that "services will need to be developed in such a way as to ensure they are affordable and sustainable. This will involve devising a clear charging policy for those activities that should attract a fee, for example, childcare." The leader of the NASUWT teachers' union, Chris Keates, said it welcomed government assurances that extended schools would not mean extended hours for teachers and head teachers. The prospectus says: "We do not expect teachers to provide childcare or other activities, nor do we expect head teachers to manage extended services." Support staff "may wish to be involved as extended schools may provide career opportunities" - particularly in "the managerial sphere". But the general secretary of the National Association of Head Teachers, David Hart, said although he supported the idea it was "fanciful" to pretend that head teachers would not have extra responsibilities. Both the Tories and Liberal Democrats raised concerns about funding for the proposals. Shadow education secretary David Cameron said: "We welcome the proposals for breakfast clubs and after school clubs - they can be real help to working mothers," he said. "But the government has real questions to answer over funding." Liberal Democrat education spokesman Edward Davey said: "Ruth Kelly will need to answer questions on whether this is real new money or whether schools will be forced to find these resources from other areas of their budgets."